Securing your downloads should be a priority to ensure other people downloading are not able to resell or distribute them. This extension of the Simple Download Monitor & Manager Plugin allows admin to store their digital content on a Dropbox account. 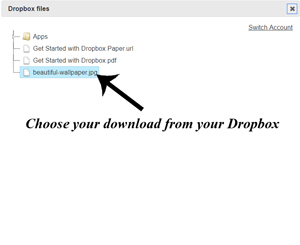 Users who click the download button will be unknowingly receiving the file from a Dropbox account. Using the Dropbox Addon for the Simple Download Monitor not only ensures the maximum security of your digital assets but also frees up space on your server (especially if you are offering a large file). 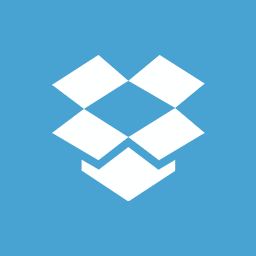 In short, Dropbox is a file hosting server where digital content can be stored. Storing large video, audio or graphic content on a Dropbox account ensures that it does not slow down your site. When using this addon to integrate your Dropbox with your download buttons, your customers will be receiving the item straight from your Dropbox account without even realizing it. 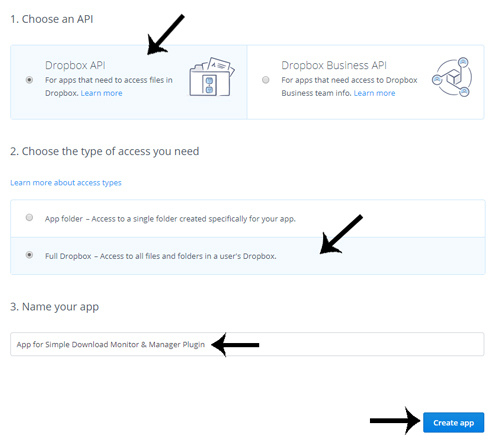 Using this addon you can deliver your digital content to the customer directly from your Dropbox account. This will involve creating an ‘App’ and then linking the product in question to the ‘App’ you have created. First, we will look at creating an ‘App’ and then we will look at how you can link this ‘App’ to your download item. 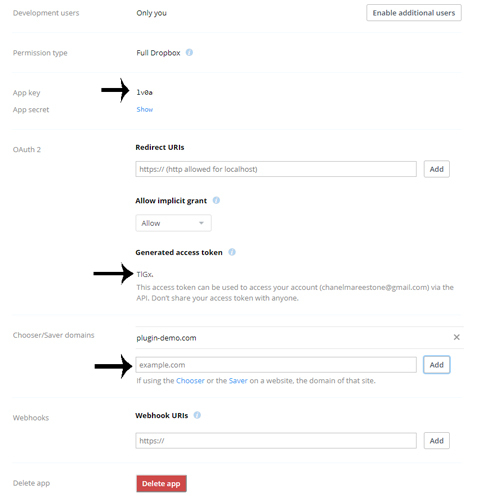 Please follow these steps carefully to create your Dropbox app. Then you will later use some of the information from this app in the simple download monitor plugin. Step 1) Login to your Dropbox Developer Account here. Step 2) Click the Create App button to create a new app to link your downloadable item to. Step 3) From the options choose ‘Dropbox API‘ and then ‘Full Dropbox‘. Step 4) Give your app a Name. Ensure the name is unique and will relate to it’s usage. For example, I named my app: ‘App for Simple Download Monitor & Manager Plugin’. Step 5) Click the Create App button. Step 6) You will now see your App Key and a button to Generate Your Access Token. See screenshot below. Generate your access token and then copy and paste both your App Key and Access Token into a notepad (we will need both these keys further on). 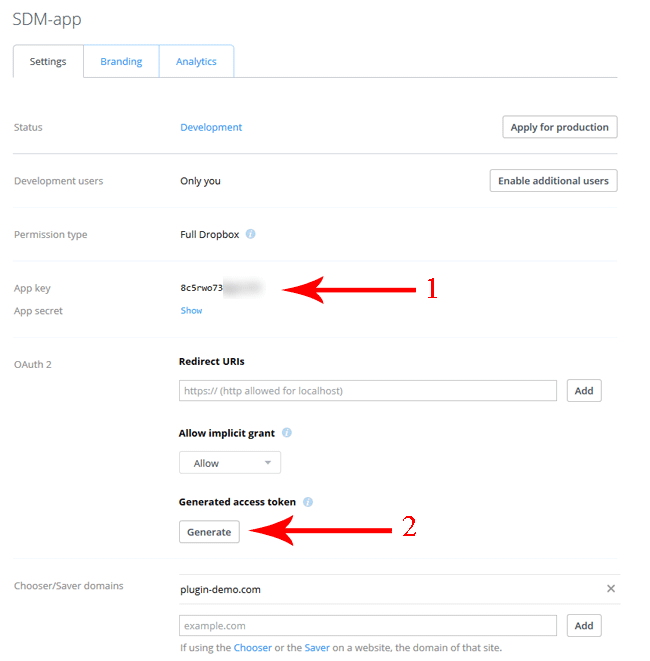 Step 7) In your Chooser/Saver domains field, add the domain of where this app will be used. Copy your root website domain (example: yoursite.com) and then click the ‘Add‘ button. Step 8) If you have saved your App Key and Generated Access Token in a notepad, you can now exit your Dropbox Developer Account. 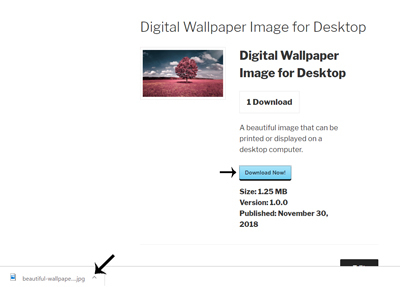 Step 1) Ensure you have the Simple Download Monitor Plugin and the SDM Dropbox Addon (It can be purchased towards the bottom of this documentation) installed and activated on your WordPress site. Step 2) Click on the Downloads menu and choose/edit the Download in which you would like to attach a file from your Dropbox account to. Step 3) In the Download File section of the Edit Download page, you will see a Dropbox button. Click this Dropbox button. 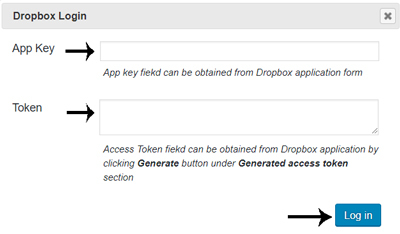 Step 4) A window will now pop up where you will need to copy and paste your App Key and Token (generated access token). Once you have copied and pasted them into the correct fields, click the Login in button. Step 5) Once you click the Log in button (if your details are correct) you will be able to click the file that you would like to attach to this download. Once you click on the downloadable item within your Dropbox, it will attach to your download page. Step 6) Now that your download is attached, make sure you click the Update button. Step 7) Go to the front end of your website and attempt to download the item. Ensure that everything is working correctly. Your users will never know that they are downloading directly from your Dropbox account. You can use the same App Keys for multiple downloads that you are offering on your website. Always ensure you keep your App Keys secret as these allow outsiders to access your files. Simple Download Monitor Dropbox Addon that allows you to configure items from your dropbox account.